Some people don’t really “get” karaoke. Like, why would one want to spend one’s time doing that? Or, worse, just watching it? Life is short, these people say (all evidence to the contrary), and it’s a big, wide world. Why hide yourself away in a basement, screaming at a wall, when there is so much else to do, to see? But then there are those that can sing, that enjoy the singing aspect of it. 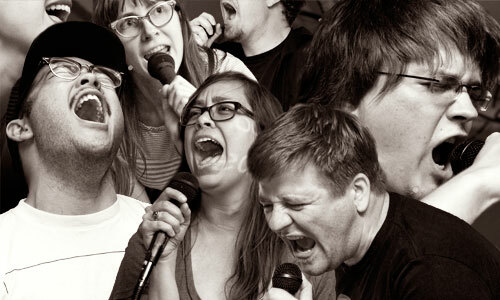 And, yeah, singing is cool, but that is not, we think, really the crux of karaoke. And there are those that like a good train wreck. Because there are indeed karaoke train wrecks (pretty much any song by Yes, for instance) — some of which are good (no, not the Yes). But train wrecks are maybe a bit too easy, are they not? No, we think the joy of karaoke is kind of like when, during a meeting at work, you liken something to Keyboard Cat… and everyone understands. Not just because everybody knows Keyboard Cat (because of course they do), but because it actually makes sense in context. This thing you are talking about is kind of haphazard, a bit fluffy. Maybe cute, but lacking depth. And, for that moment, you feel like you have accomplished something. Because, in this life, there are so few moments of true communal understanding. And, sure, it is silly, and ultimately meaningless, but without an occasional outburst of silly the world can all seem a bit soul crushing, can it not? And so there you are, humans, together for a brief moment — in the same space physically, yes, but also, in a way, together spiritually. A little glow radiates out as you pat your hands on the table like paws. This is what karaoke is: a radiating glow from tiny cat paws. Nothing much, perhaps, but also not nothing. We’re working on an overhaul of our song list… Stay tuned for more info.